This book is subtitled “A Concise History” which I initially thought to mean exactly the opposite of what it actually means: a birdfly overview, a summery. In about a 100 pages Antoine Faivre (1934-), former head of the Paris University esoteric chair, speaks about some 2000 years of esotericism. He quickly works towards the Renaissance to give the period from then to our own day some more space. The author opens with setting up his framework. Six meanings of the term “esotericism”, the meaning that his uses, indeed, a methodology as a scholarly work like this needs. From then on a staggering amount of individuals and groups fly by high and low, often not more in depth than given a name and the primal title that that person produced. Only a handfull of characters are written about with some more length. Especially when we come closer to our own time, Faivre seems to have a preference to French thinkers and authors influenced by esotericism. This leads to names and titles (the bibliography is also for a large part French and the book was originally written in French, probably for the students of the Sorbonne) that hardly ring a bell. A good turn in this emphasis is the presence of René Guénon. Faivre includes Guénon in the stream of Western esotericism and even seems to use some of his methodology for his own. 19th Century Theosophy is called “Theosophism” (“generic term”) that I only know from Guénon. Furthermore, esotericism is presented as mostly a search for the philosophia perennis. Faivre is both laudatory and critical towards Guénon. The inclusion of Guénon was one of the decisive arguments to buy the book and it was nice to see a scholar put Guénon (and some of his followers) in the line of influence and history and read come critique from an outsider. 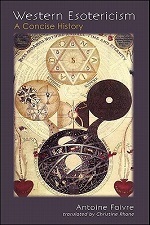 Overall the book will not learn you much about esotericism. You will get a whole lot of names, shortly put in their historical framework so you might run into a lead to follow. Faivre’s aim is also strictly historical. He almost never says anything about the ideas of the people that he writes about. With the large index and helpfull bibliography it is probably nothing more (but on the other hand, probably meant to be nothing more) a starting point for students in the field.